I've recently gotten a fried chicken recipe that I really enjoy. However, the coating (seasoned flour) is held on with egg and cream (mix 1 egg and 1/4 cup heavy cream, dip the chicken in the flour and then in the flour, fry). One of my family members is allergic to milk so cream is not an option for a family meal. In the case of the breading recipe that you have mentioned, I believe that you can continue to use soy milk (or almond milk, or even water) mixed with the egg in your breading. Instead, a small change to technique should give you a thicker and crunchier coating. You may need to increase the amount of egg/soy milk mixture you create. Dip the chicken in the egg/soy milk mixture. 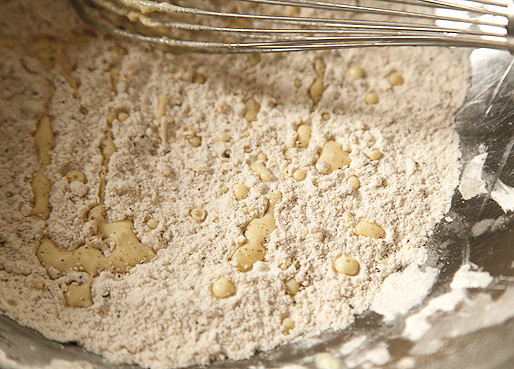 Sprinkle your flour mixture with droplets of the egg mixture, and mix so that begins to form small clumps, as if you had already been using it for many chicken pieces. Dredge the chicken pieces in the flour mixture again, creating a second layer with bits and clumps sticking to the chicken pieces. This should provide a crunchier, more satisfying crust than a simple single dredge in pristine flour due to the lumps and clumps which will fry up and be crunchy and toothsome. My grandma in Louisiana used to use mayonnaise & beaten egg to "double dredge" the fried chicken. She also insisted on 'unsweetened' mayonnaise, like Duke's Mayo (a regional southern brand). Not the answer you're looking for? Browse other questions tagged substitutions frying dairy-free or ask your own question. How to prepare a KFC - like coating for fried chicken? Can semifreddo be used in fried ice cream recipe? Can chicken be partially deep fried to fully fry later?